Today was yet another day that didn't quite go to plan. I won't bore you with the tedious details as I'm saving the wry observations about where I went for another blog post. I'll just mention that my intention was to capitalise on the husband and child both being out (separately) for the day and have a go at making sushi. This has now been postponed to a rush-job tomorrow during the twenty minutes or so of the child's afternoon nap. In some ways, I'm quite glad that I didn't have time to potter at home as on Day 4 of the diet, I am craving cake. It doesn't help that lots of my Twitter pals are busy tweeting pictures of the glorious cakes they're able to make because they are not having to be ridiculously healthy to shift a lot of weight. @kateselwood1, @dickybundock, and @harbourhussy being just some of the culprits (definitely worth a follow as they're all lovely tweeps though). 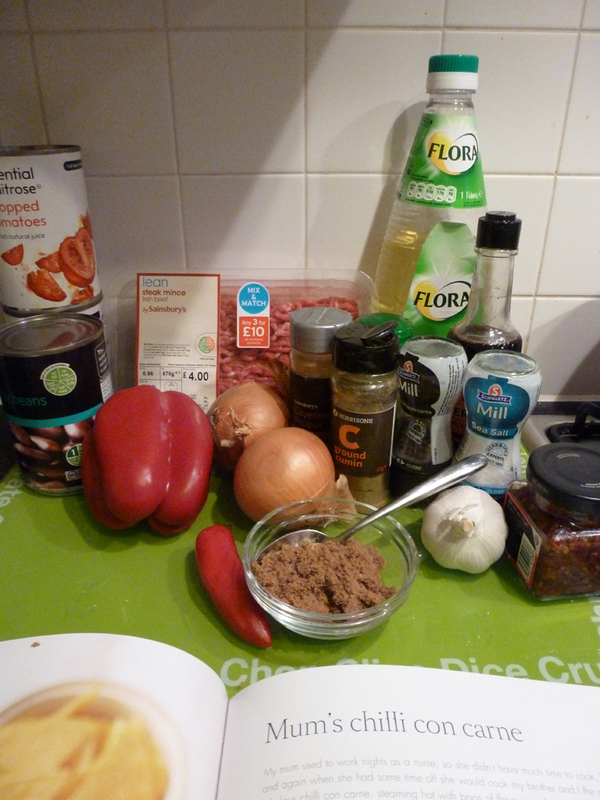 And so it was that I ended up making Lorraine Pascale's chilli for tea. This had been planned for another time as I wanted to start stockpiling a few meals for when I go back to work next week. Sometimes, there's nothing I want to do less than cook three separate meals when I've been out of the house since 6am. It's worse when I'm on a healthy eating jag, so having calculated that this was a reasonably diet- (I hate that word) friendly recipe, I gave it a go with the plan to freeze several portions. This particular recipe is one that Pascale's mum used to make her with a few tweaks. Despite eating chilli a fair bit, it's something I've never made from scratch. I've always used the Old El Paso Chilli Seasoning pouches. Which is silly. Because you still have to do all the chopping and adding of extra things like tomatoes and veg. It just saves having to wade through cupboards looking for rarely used herbs and spices (although now, my spice collection is just taking up all the spare space on my microwave I use them so often). See my family don't like spicy things. And of course growing up in the early eighties, and living with my grandparents who had survived on war rations, exciting food was hardly de-rigueur. I remember pleading with my grandfather on one occasion to let my mum cook spaghetti bolognaise for tea. Such a meal was positively cosmopolitan as far as my granddad was concerned. It eventually became a household staple. To be fair, when my gran retired, she did try some more adventurous meals, but her cooking was best when it was simple comfort food. Another household staple (and my second favourite after spag bol) was mince, beans and rice. Which is basically my mother's bolognaise sauce with a tin of baked beans mixed in. 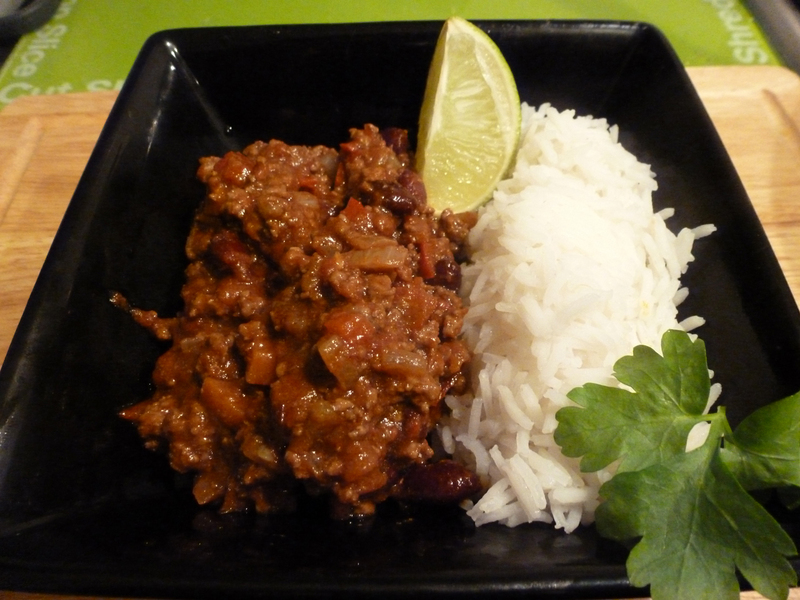 So chilli without the spice. But suggest to my mother now that she should try chilli that isn't spicy but just tasty and she will turn her nose up at it without further consideration. She's missing out. Spicy food is really an anathema to my mother. Mention Indian food and she breaks out into a cold sweat. Likewise, anything from the Chinese that even mentions it's been near a chilli and she wouldn't entertain it. So she made me chuckle last week when she asked what Thai food was like. My normal response is 'really tasty Chinese food'. Because it is. The dishes are similar, but the flavourings are just much more intense. But to my mother, I said 'it's like really tasty Chinese food BUT it's really hot'. Oddly, that didn't deter her. She's still intent on going out on whatever shindig it is that's frequenting a Thai restaurant. The woman who won't eat tasty chilli going for an all out Thai chilli fest. Oh to be a fly on the wall. Getting back to Lorraine's mum's chilli. It is one of those comforting dishes. It really tasted like something a mum would make. There's nothing massively special and mindblowing about it. But on a cold, wet, windy night tonight, it's like having a lovely foodie hug. It required a lot of tasting during cooking. To start with I wasn't convinced by the flavours. I'd added a carrot and a couple of celery sticks to bulk it out a little and to try to get some veg into my fussy toddler's diet (she's having this for tea tomorrow if I don't sneak downstairs and make a midnight snack of it). But if I'd paid attention to the blurb around the recipe, I would have read that the flavours take time to develop. Even after an hour of simmering, it wasn't doing it for me. But then I left it for another hour and reheated it. And as if by magic, it tasted just about right. I did add a little tomato puree (about 1tbsp) to compensate for the less than tasty chopped toms I used. When I'm done with the stricter side of healthy eating, I'd love to give Thomasina Miers' chilli a go as that's a more authentic Mexican type recipe that takes nearly all day to cook, has a touch of chocolate in it (still intrigued by this one) and uses stewing steak rather than mince. I think this will become a staple in the Crowdey household - at least for me! The recipe can be found in Home Cooking Made Easy although there is a very similar one on the BBC Good Food website that is very highly rated too.